The owners (Bee and her husband) are a professional couple who live and work in the UK. They fell in love with Lasabana while on holiday in Cyprus and acquired it as a holiday home for them and their three sons to enjoy. .
Due to work commitments, the family are not able to use the villa as much as they would like to. However they are happy to share it with guests who appreciate a private and tranquil setting with uninterrupted stunning views of the mediterranean. Since purchasing the place in 2010, various updating and improvement projects have been undertaken. The latest of which is provision of heating for the swimming pool (2016). In addition to the above, the position of this detached villa is very convenient for the airport, coral bay and Paphos irrespective of whether the guests choose to hire a car or not. Buses are frequent and for those with a car/s, there is space to park up to 3 cars. The villa has abundance of outside space and beautiful well maintained gardens. Shops, restaurants and beaches are either within walking distance or a very short drive / ride (by car or bus). The kitchen is equipped with all the equipments and provisions required by guests. Potential guests are advised to read the reviews which speak for themselves. Furthermore, communication with Bee and her villa managers is easy. Bee supplies precise information to visitors and responds promptly to all e mails generated by potential and confirmed guests. Guests are assured of a very clean and well set accomodation. Bee can also organise transport from and to the airport for those who wish. She is also happy to organise a shopping list for guests who require such service. The master bedroom has an en suite bathroom with shower over bath. Two shower rooms are available one of which is en suite to the second bedroom. Bath and hand towels, bath mats and pool towels are provided. A guest toilet and washbasin are present on the ground floor. Dining kitchen. A further dining table is available in the Veranda outside. Heating in cold season is available if required by prior arrangement with Bee. This incurs an extra charge for the whole period to cover expenses. Older children are welcome but the parents/carers must take sole responsibility for their safety particularly in relation to the swimming pool which is open and has no barrier surrounding it. Smoking is only acceptable outdoors with responsible disposal of cigarettes and ash. The back garden is made up of plant beds covered by pebbles that are separated by foot paths. There are sun beds and patio furniture. A barbecue and a pool side shower are available. The best aspects of the home were the pool and the gorgeous landscaping. We did have some outdoor lighting issues and hot water issues during our stay. However, the hosts were very communicative and remedied the issues in a timely manner. Additionally, most of the grill tools had rusted so I had to purchase new ones at the store in order to use the grill. Thank you for your review and I am very pleased that you enjoyed the pool and the outside space. It wasn't a problem to sort the issue of the lights within less than an hour after you contacted me. As the villa is directly on the seafront and the BBQ, is facing the sea, it is not uncommon that grills get rusty very quickly if left outside. This is why there are some inside the house between the cooker and fridge for guests to use and bring in. Unfortunately you may not have noticed them. Hope you decide to come back again in the future. The cleanliness of your villa is very good all round and the provision of basic food for arrival is much appreciated. The pool area is well organised, well equipped and well maintained to a high standard. It enjoys the direct sunshine all day and has splendid views over Potima Bay. A rear access path makes it easy to walk down to the beach. We had a very comfortable, relaxing stay and appreciate your availability for information and help during that time. I would have no hesitation in using Lasabana in the future. Your comments are very much appreciated. Many thanks for your review and for pointing out the cleanliness, the views and the closeness of the villa to the beach. I would be very happy to have you back in the future. You and your family have been excellent guests. We have returned from a wonderful week at this fantastic villa feeling totally relaxed and refreshed. It’s location provided everything we wanted. Peace and tranquility in a quiet, elevated residential area with the most incredible view, yet within walking distance of a wonderful beach bar and delicious restaurants and a short drive into Paphos or Coral Bay. The villa is set on 3 floors, with bedrooms on the top and bottom floors giving privacy and spaciousness and a central floor for daytime use leading out onto the stunning terrace, pool and BBQ area. The gardens are exceptional, with stunning trees and plants and dragonflies enjoy sharing the garden and pool edge with you, just beautiful!! We really had an amazing time on this very friendly island where it was so easy to explore and enjoy ourselves. The owner kept in close contact with us on booking, before, during and after our trip, checking everything was as we wanted at all stages and responded to any questions we had almost by return. We couldn’t have asked for more. Highly recommended and we would definitely return. PS. Would definitely recommend the turtle glass bottomed boat trip from Paphos Harbour, you really do see turtles, (we saw 36!!!) it was amazing! We also hired quad bikes from the end of the road and had a fantastic day exploring Lara Bay and the Akamas Peninsula and Avakas Gorge. I am very pleased that you had a great time and many thanks for this fantastic review and for your recommendation of things to do and the nearby local bar. I am also pleased that you appreciated the garden, the views as well as the piece and tranquility. It was and still is a pleasure to communicate with you and I will be very happy to have you back. Thank you very much for this fantastic review. It was a pleasure to have you and your family at Lasabana. I am pleased that you enjoyed the amenities within the villa, made use of the BBQ and found the position convenient for public transport and shopping. Hope that you do go back again in the future. This lovely home suited us perfectly and we've had a most restful, enjoyable holiday. Plenty of good quality furniture everywhere - in the garden, on the veranda and indoors. Everything was kept very clean. The owner was highly organised, prompt in responding and helpful. Extensive kitchen equipment - the large fridge was well used and we appreciated the good stock of seasonings, herbs and spices etc. The welcome grocery essentials were a real plus as we arrived well into the evening. The location - we enjoyed the walk to both beaches for swimming, the stroll to the beach bars and restaurants and bus route nearby. The excellent bus service. We only used our hire car for transporting our luggage from the airport and shopping for groceries! We didn't travel far as we had planned a 'horizontal' holiday but we enjoyed the water sports at Coral Bay, the Harbour for meals out and loved the Archaeological park with amazing mosaics. Many thanks for this comprehensive / detailed review. You covered many of the issues that guests would like to know when choosing holiday accommodation. For this I am very grateful. It was my pleasure having you for two weeks in my home and hope you do decide to go back again. Overall we had an amazing stay at Bee's villa. The views were breathtaking and the sunsets amazing. The villa was comfortable and was within walking distance to some great restaurants. Doria was one of our favourites. Bee was excellent in her communication and sorted any issues immediately and is a wonderful host. The only negative was three 3 broken chairs which we mentioned to Marcus on our arrival. They each had an arm broken off which made sitting rather uncomfortable . Other than that, our stay at La Sabana was amazing. I am very Pleased that you had a good holiday and enjoyed your stay at Lasabana. I am also grateful for your kind words. Please accept my sincere apologies regarding the garden chairs. This has been communicated to Marcus for immediate action. You are very welcome to come back to Lasabana in the future. 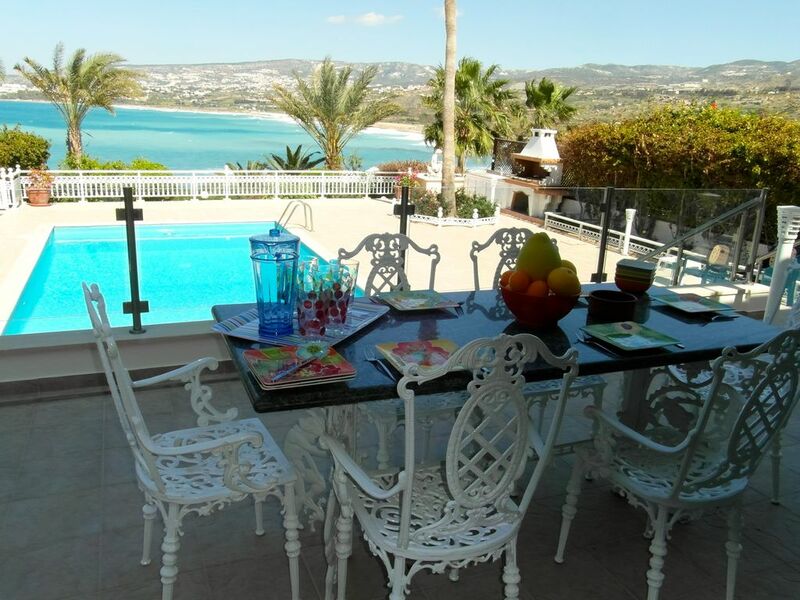 The villa is in an ideal location at the Coral Bay area, which is south west of Cyprus. It is only 20 km from Paphos airport and 8 km from the Town Centre. Coral bay with its famous safe sandy beach, restaurants, bars, shops and banks is only 3.5 km away. A regular bus service to Paphos and to Coral Bay is available near by. This part of Cyprus is well known for its mild and sunny climate throughout most of the year, which makes it an ideal location for couples of all ages on a relaxing or romantic holiday as well as for families with children. For those who want a more energetic holiday there is trekking, climbing, skiing, fishing, water sports and golfing. An excellent motorway system is a bonus connecting Paphos to the modern cosmopolitan cities of Limasol and Nicosia (1 and 2 hours drive respectively). Golf: There are 4 main golf courses (Aphrodite Hills, Minthis Hills , Elea and Secret Valley). Aphrodite Hills: an 18-hole golf course, designed by acclaimed course architect, Cabell B. Robinson. Five years in the making, it follows the scenic contours of the two plateaux, its challenging fairways cutting a swathe through lakes, olive and carob trees. No wonder the course has taken its rightful place among the very best the Mediterranean can offer. ladies and gents changing rooms with showers. Tennis court and outdoor swimming pool available for after the game or non-golfers. Players without handicap certificate can play after 12 noon on request, according to availability. Elea Golf Course: designed by Nick Faldo and caters for all abilities. Ski: Cyprus is a wonderful island of contrasts. Where else could you ski or snowboard in the morning and then be sunning yourself by the pool or on the beach in the afternoon? During December the Troodos Mountains are covered in snow and there are a number of ski slopes that you can use right through until March. Troodos Mountains are home to Mount Olympus (altitude 6402 ft) which has a cap of snow for 3 to 4 months of the year and is where the ski resort is based. Equipment hire is available and the prices are terrific value compared with Alpine slopes. Pool heating during cold season is for the whole period and is available by prior arrangement (this incurs additional fees to £25.00 per night to cover costs). Wifi is available and free. Complimentary tea ,coffee, Water and Biscuits will be provided on arrival. If you have any other requirements or would like further items , we will do our utmost to satisfy your request at an additional charge. Transfers can be arranged with the local taxi company. Please note the rental rates are inclusive of the use of air-conditions & central heating, Cancellation policy: The booking fee of 25% is not refundable. For cancellations within 8 weeks of the start of the holiday (i.e. when the full balance has been paid), only the security deposit of £400.00 will be refunded. Guests are advised to take holiday cancellation insurance. If guests book within 60 days prior to the holiday, the full payment together with the security deposit is required.